For the best part of eight years, multilateral 'development' agencies, including the international financial institutions (IFIs), have lauded the Pakistani government's economic reform programme. The narrative went something like this: in October 1999, the Pakistani economy was on the verge of collapse due to gross mismanagement and corruption. The incoming military regime, armed with an abundance of technocratic hitmen, rescued a sinking ship by designing and then implementing a reform programme that addressed the fundamental distortions in the economy. I've never lost money on the stock market, not in this country nor in any other, for the simple reason that I've never in my whole life played the stock market -- which is the only sure-fire formula for not getting suckered into losing your shirt. But for those investors who are obsessed with playing the stock market and insist on dabbling in Hubco shares on the Karachi Stock Exchange, or plunging into whatever is left of the dotcom bubble after the great Wall Street meltdown of 2001 and 2002, or financial stocks after the bursting of the US housing sub-prime mortgage bubble of 2007 and 2008, here are some unusual tips. 69-year-old, frail, mosquito-weight but steel-nerved, Shahtaj Qizilbash, convener of the Joint Action Committee (JAC) for People's Rights, is seen on the forefront of every protest demonstration organised by civil society organisations in Lahore. She is called 'The General' by close friends for her leadership qualities. She was born with literally a silver spoon in her mouth. Her mother was princess of a small princely state in the state of Maharashtra in India, while her father was from the Qizilbash family of Lahore. The prevailing violence in the Federally-Administered Tribal Areas (Fata) and non-projection have been casting a shadow over the tourism sector, though all the seven tribal agencies offer scenic sites to tourists and holiday-seekers. The Khyber Steam Safari (KSS) is no exception and requires immediate attention to resume its glorious ride between Peshawar and the enchanting Landi Kotal. Pakistan does not have an enduring democratic tradition. Since the country's inception, it has experienced three extended periods of military rule, interspersed with short spells of democratic government. Though elections were held periodically, they usually reflected regional populist loyalties. The Federal Board of Revenue (FBR) evaluates its performance in terms of 12-14 per cent growth it has achieved in revenue collection in the last five years, which in real terms -- after taking into account the ever-soaring inflation rate -- is no more than five per cent. Even this growth has been achieved by shifting the burden of taxes to the poor through increased reliance on indirect taxes. Are seminaries in Pakistan really breeding violence and hatred, and not imparting education? In his inaugural speech in Parliament, Prime Minister Yousaf Raza Gillani announced the setting up of a Madrassa Regulatory Authority to oversee the functioning of seminaries across the country. It goes without saying that madrassas have been a hot topic of discussion for about a decade. The previous regime had also undertaken a number of initiatives to reform madrassas, but on the whole these efforts failed to bring about the desired changes. Therefore, it is necessary that the current effort is guided by a full understanding and analysis of the situation. The political corridors of Pakistan seem to be resonant with the voices of a fresh and enthusiastic start towards a vibrant political milieu. The parliament is expected to be a leading institutional arrangement to counter multi-faceted challenges to the country of more than 160 million people. The Pakistani society is a complex one, where emotions sometimes overcome intellectual faculties and rationale. Since 1947, we have seen that political violence has not only become a part of our political culture, but has also become a hindrance in the establishment of true democratic norms and values in the society. The current wave of politics of violence is a bad omen for democracy, which demands accommodation and reconciliation among different political actors, rather than use of force. Imagine the surprise then when the World Bank released a report only a few months after the Shaukat Aziz led team of economic managers vacated their cozy positions in Islamabad, asserting that the Pakistani economy is gripped by a multitude of severe crises. The report claims that corruption and mismanagement actually increased during the tenure of the previous government (or should one say sitting government, given that Pervez Musharraf refuses to vacate the Army House / presidency). The report admits that poverty too has increased due to many factors, though unprecedented food inflation stands out as a major cause. Finally, there is an acknowledgment of a major power shortfall and a warning about the serious social conflicts to which this shortfall could give rise. Notwithstanding the rather remote possibility that the World Bank -- along with the International Monetary Fund (IMF) and the Asian Development Bank (ADB) -- has been kept in the dark about the realities of Pakistan's economic 'miracle' engineered by Shaukat Aziz and Pervez Musharraf, the quite remarkable about-turn in its diagnosis of the state of the economy is staggering. In the main, it smacks of intellectual dishonesty: for at least six years the underlying weaknesses in the economy were essentially swept under the carpet, while the easily marketable 'successes' were publicised incessantly, presumably because the prevailing geo-political situation demanded that Pakistan's military regime be presented in such light. Working people have been wondering how the technocrats in Islamabad and Washington managed to simply overlook the fact that a major electricity crisis was in the making, or the fact that the prices of basic food items, including atta, were increasing at rates that would lead to acute deprivation. Granted that food prices have shot up all over the world and Pakistan's is not the only economy struggling to match up to the rigours of global markets, the fact of the matter is that the Shaukat Aziz-Pervez Musharraf regime and its international creditors simply never accorded the basic needs of working people the importance in their policy logic that could have prevented the emergence of some of these eminently avoidable crises. Their rhetoric, of course, was always to the contrary. Pro-poor growth and other slogans were commonplace, as they are in almost all Third World countries where the IFIs have a major say in the design of economic and social policy. But this cannot disguise the fact that the neo-liberal paradigm that underlay the economic reform programme over the past few years clearly privileged the interests of capital, and that too financial capital, over that of the people of Pakistan. Of course there were beneficiaries, and not just the super-rich. A credit boom allowed a significant urban middle class to engage in a major consumption binge, which, alongside investments in the stock market and real estate, explains the relatively high growth rates. But again one is taken back by the completely haphazard manner in which this growth was conceived. The consumption boom has exposed the power shortfall, the volatility of the stock market has repeatedly caused multi-bullion rupee losses and urban real estate prices have exacerbated the already severe economic vulnerability of a large majority of asset-poor Pakistanis. It is important to bear in mind that Pakistan is not the first or the last example of a great economic reform story gone bad. The IFIs have backed radical liberalisation of financial markets all over the Third World, and in the vast majority of cases the consequences have been disastrous for the majority of people and the natural environment. The development 'experts' claim that poverty and development are technical matters, and can be meaningfully addressed through plans hatched in boardrooms far removed from the relevant context. James Ferguson famously called the international development industry the 'Anti-Politics Machine', because of the deliberate manner in which poverty and development were presented as 'apolitical' problems. In actual fact, of course, the interventions designed by the IFIs are explicitly political, and reinforce existing socio-economic and political structures. More generally, the IFIs attempt to make what should be policy choices into policy imperatives. Take, for example, the rhetoric that is currently doing the rounds about the need for the new government to under take much-needed measures to correct price distortions, even at the risk of inciting popular opposition. It is said that successive governments have refrained from increasing petroleum prices, even though the increasing prices of oil internationally objectively demanded a domestic increase. The fact of the matter is that governments are well within their rights to maintain subsidies for fuel, or any other good or service for that matter; there is no hard and fast rule that domestic petroleum prices must increase in proportion to international prices. Of course, no economy in the world is insulated from the pressures of the global market, but given this basic constraint, individual states that claim to be sovereign are bound to a particular kind of economic orthodoxy -- not because they must be, but because they choose to be. Iran, for instance, fixes the price of petroleum for domestic consumption at $0.10 a litre. If a consumer wishes to buy more than 30 litres of petrol in a week, the price goes up 10 times. This pricing policy reflects the Iranian government's political priorities, namely to ensure that its citizens are guaranteed consumption security up to a point. Of course, one can point to the fact that Iran is one of the world's biggest producers of oil and can afford such a policy. But there are similar pricing policies in other Third World countries that are not oil producers, such as Cuba and India (though not in all states). Of course, Pakistani governments constantly face a major revenue shortfall -- but this is not because they do not reduce subsidies on basic consumption items, but because they do not tax the rich. The neo-liberal paradigm is projected as divine truth, not because it produces unambiguously positive results for the people of a country -- who should be the beneficiaries of any economic or social policy -- but because it is consistent with the political and economic objectives of dominant national and international forces. Thus, when these same forces overnight turn eight years of 'good governance' into 'bad governance', but yet demand implementation of virtually the same policies, one should not be surprised. One can only hope that Ishaq Dar and his team of economic managers do not uncritically accept the dogma of the 'Anti-Politics Machine'. I've never lost money on the stock market, not in this country nor in any other, for the simple reason that I've never in my whole life played the stock market -- which is the only sure-fire formula for not getting suckered into losing your shirt. But for those investors who are obsessed with playing the stock market and insist on dabbling in Hubco shares on the Karachi Stock Exchange, or plunging into whatever is left of the dotcom bubble after the great Wall Street meltdown of 2001 and 2002, or financial stocks after the bursting of the US housing sub-prime mortgage bubble of 2007 and 2008, here are some unusual tips. I say unusual because the tips come not from stock market analysts or stock market insiders but from the domain of literature, of all things. Ernest Hemingway's Nick Adams is a character partly based on Hemingway himself. The protagonist of stories set in the Michigan woods, Adams is a very practical person who seems at home anywhere, judging from stories like Big Two Hearted River. He knows things like how to collect grasshoppers early in the morning while there is still dew on their wings, making it easier to catch them. He carries a bottle around his neck to keep them in. He fishes after the sun has risen and the fish are more active. And he never fishes near the swamps, even though there are large trout there. It is too difficult to land them, and he would end up losing fish, bait and time. The moral of the story is: if you're going fishing in the stock market, stay clear of the swamps. Daniel Defoe's Robinson Crusoe, because of his isolation, is forced to be prudent and economical. At one point, Crusoe raises a fence around his encampment by driving stakes into the ground. He unwittingly discovers the process of dry-wood cuttings when the green stakes take hold and sprout into an impenetrable living barricade -- a great return on a small investment. Alexander Dumas' swashbuckling romance The Three Musketeers (in fact, there are, for some inexplicable reason, four of them: D'Artagnan, Athos, Porthos and Aramis) are proud, courageous men without the benefit of a stake. "Listening to D'Artagnan's plain matter-of-fact account," writes Dumas, "the Duke looked at the Gascon from time to time in wonder as if he could not understand how so much prudence, courage and devotion could belong to a man who looked barely 20." The Three Musketeers has all the elements of the grand life lived wholly -- courage, fidelity, love, honour. But you cannot live the grand life playing the stock market. Many people think Sir Arthur Conan Doyle's Sherlock Holmes is a real-life detective and still write to him for help, addressing their letters to 231-B Baker Street, London. That premises is now part of the UK home mortgage company Abbey National's offices, and the company has a small group of staff devoted exclusively to answering letters addressed to Holmes. The standard form reply letter says: "Mr Holmes has retired and moved to the country, where he has become a bee keeper. He no longer takes cases, but thank you for writing to him all the same." But in the days when he did take cases, Holmes would get clues others were programmed to overlook, using his skills and experience, looking and observing with a non-assuming eye, with imagination to recreate and science to verify. In short, a great deal lay behind Holmes' celebrated and oft-repeated remark: "Elementary, my dear Watson." And here is Holmes talking to Watson in The Adventure of the Illustrious Client: "The first thing is to exaggerate my injuries. Put it on thick, Watson. Lucky if I live the week out -- concussion -- delirium -- what you like! You can't overdo it." Wounded investors, who've burnt their fingers badly on the stock market, will know what he means. Mark Twain's Tom Sawyer has many praiseworthy qualities: a sense of adventure, openness, alacrity, resilience and adaptability. Tom gets into scrapes, but goes on to the next adventure wiser and still open. He is able to get to the crux of ideas unencumbered by societal notions. He's able, for example, to form his own ideas about Jim, the black slave who also features in The Adventures of Huckleberry Finn, the sequel to The Adventures of Tom Sawyer. Tom is an expert at games and deception. And his adventure in the cave is classic speculative symbolism -- as in the case of stock market speculators. On the subject of deception, Homer's Odysseus has been described by British chess grandmaster Nigel Davies as "one of the greatest masters of deception". Davies says: "Tying yourself to the mast to resist the siren call is a useful concept for investing." J.R.R. Tokien's wizard Gandalf in The Lord of the Rings (voted the greatest novel of the 20th century in a UK poll in 2000) has acquired hordes of new fans ever since the movie version came out. In Tolkien's tale, the world is in dramatic and irreversible change, and Gandalf picks up his staff and leads the inhabitants of that world through the chaos. All the while, he adapts as events dictate -- an invaluable trait for investors as well. Davy Crockett, as he describes himself in A Narrative of the Life of David Crockett of the State of Tennessee may not qualify as a great literary character and certainly not one to be nominated for a modern PC award anytime soon. But anyone who claims to have killed 105 bears in a year has to be a model for investors, especially in an era when bear markets seem to have overwhelmed the bulls. Jack Aubrey, the sea captain hero of Patrick O'Brian's adventure yarns, is handy at going for the jugular. Aubrey's philosophy can be summed up thus: "Never relax for a moment; defeat is just around the corner." Shakespeare, of course, had his own take on the subject of wealth. Speaking of his own verse, he said: "Not marble nor the gilded monuments of princes / Shall outlive this powerful rhyme." As with most things, he was spot on about this as well. Shahtaj Qizilbash was different from all her cousins, both male and female, because since childhood she took a fancy to sports like swimming, riding, etc. She got her early education from Convent of Jesus and Mary, Lahore. She does not like to talk about her personal life. Shahtaj Qizilbash spent a lot of time with her uncle Nawab Muzaffar Ali Qizilbash, who also remained Pakistan's ambassador to France. When she returned to Pakistan from England in 1983, she found the atmosphere charged with women on the roads, particularly against the discriminatory laws introduced by General Ziaul Haq. A woman like Shahtaj Qizilbash could not remain indifferent to this situation and jumped into the fray. 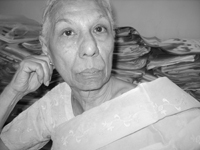 Since the early 1980s, she has been part of every agitation for people's rights. She is an active member of the Women Action Forum (WAF). When Asma, Gul Rukh, Hina and Shela established an all women's law firm (the AGHS), she joined them and took the task of paralegal training, which she is still running with dedication. She is also looking after a women's shelter home named Dastak. The News on Sunday: Please tell us in detail about your family background? Shahtaj Qizilbash: I come from the affluent Qizilbash family, but I have been totally different from my family. My thinking, my ideas and my direction of life has been totally different. I have never acted like a nawab's daughter. In 1983, when I came back from England, the Women Action Forum (WAF) had just started and since then I have been on the roads. TNS: Why are you different from the rest of your family? Who influenced you? SQ: I don't know. I have always been different. I have never thought that I am from a royal family. I have always been very active. I lead an active life. Even in my teens, I indulged in riding, swimming, mountain climbing, etc. Nobody changed me. I think that my schooling contributed a lot to setting the trend of my life and thinking. At that time, education was taken more seriously. I was also active on the social front. You learn from the milieu around you. TNS: When did you join the AGHS? SQ: I joined the AGHS in 1989. This was part of the movement, since we were working together in WAF. An idea was floated that educated women should come on the roads to protest against the Hudood Ordinance, but despite being directly affected an overwhelming majority of women were not aware of their rights. Then Asma requested me to join the AGHS and start a paralegal training programme. I did not respond initially, but joined later on persuasion. Believe me, when people known to Asma were requested to send their wives and sisters to attend the paralegal training programme, no one responded in the positive. TNS: How did the paralegal training programme start then? SQ: I was roaming near Molanwal. It was closing time for schools. Teachers were coming out of school. I talked with them. Our target was to get 60 trainees, but we could gather only 40. TNS: Tell us more about the paralegal training programme? SQ: It is basically a nine-month awareness programme. The women come for training for two days a month. The programme has become so popular that for 60 seats, we receive more than 100 applications. Now women apply on their own. Besides the legal training, they also discuss their issues and current affairs. We have 11 paralegal centres in Lahore and one in Kasur. In the last 23 years, about 1,400 women have completed the paralegal training programme, which is open to women of all ages. These women include housewives, students, councillors, teachers, lawyers, etc. The only criterion is that they should be able to read newspapers and write letters. Every year, 60 women are selected through a process that also includes interviews of applicants. The programme is based entirely on legal matters, such as marriage and divorce laws, custody and well-being of minors, crime cases, family laws, property cases and the Constitution of Pakistan. Additionally, it is ensured that paralegal trainees also get a firsthand experience by visiting both the civil courts as well as the high court. They also get a chance to watch the proceedings of a number of cases, especially those pertaining to family laws. They are also taken to judges' chambers, so they can ask quires from and share their opinions with them. They are also introduced to issues like human rights, child rights, minority rights and environmental pollution. Besides field visits and lectures, they also attend press conferences and take part in protest rallies organised by various civil society organisations. TNS: Haven't you thought about opening such centers in other cities too? SQ: Many women get the training and move to other cities after their marriage. They carry our message to other cities. They do legal counseling, for which people approach them. If there is a need for legal assistance, then the matter is referred to the AGHS. TNS: Why was there a need to open Dastak? SQ: Some of the women who approached us for resolution of domestic disputes and violence-related matters said there was a threat to their lives and they needed lodging too. Initially we used to keep them at our friends' houses, but later realised the need for establishing a women's shelter home; so Dastak was established in 1990. In the beginning Dastak was attached with the AGHS, but now it is an independent trust. We faced a lot of difficulties initially, because we did not have the experience to run a women's shelter home. We learnt by doing. TNS: A girl was also murdered at the AGHS office a few years back. Can you tell us more about that incident? SQ: The murder of Saima was a big tragedy. Thank God, it did not happen again, though girls do receive threats. Women are still murdered in the name of 'honour', but this is done mostly in the NWFP. TNS: What are the reasons behind domestic violence? SQ: The major reason is poverty -- if there is hunger, there will be quarrels. Moreover, there is no concept of family planning and there is a lot of unemployment. All these factors contribute to domestic violence. TNS: Do you think that there is more awareness among women about their rights now? SQ: Yes, there is a lot of awareness about women's issues now. If you look at the literacy rate, you would see that the percentage of girls in school is higher than that of boys. In the past, if a woman went out of house for work people raised questions but now this has been accepted by the society. There has been a sea change in the last few decades. TNS: When and why was the Joint Action Committee for People's Rights established? SQ: JAC was established when in Benazir's second government, Nawaz Sharif introduced the Shariat Bill is the Senate. It shook all and sundry. We formed a committee, which was later named JAC. It is a joint front of civil society organisations. This bill could not be tabled in the National Assembly because Benazir's government was dismissed. We, however, decided that in order to continue creating awareness, the platform of JAC should remain. The committee meets regularly once or twice a month depending on the situation. JAC also took a very active part in the lawyers' movement for the restoration of judiciary. The Pakistan Muslim League-Nawaz (PML-N), however, reaped the benefit. The party was given votes because of his clear cut stance on the issue of judges' restoration. When Chief Justice Iftikhar Muhammad Chaudhry said 'No' to General Musharraf, he became a hero and people came on the roads in solidarity. TNS: How do you see the women's rights movement in Pakistan right now? SQ: Very bright. Look at the speaker of the National Assembly. For the first time in the history of Pakistan, a woman has been elected as speaker of the National Assembly. It is a welcome move, which will boost the morale of women. TNS: In the recent general elections, some political parties -- including the Awami National Party (ANP) -- did not allow women to cast votes. What are your views on this? SQ: Unfortunately this trend is still there, but it is on the decline. Maulana Fazlur Rahman, though a coalition partner, did not vote for Dr Fehmida Mirza in the election for the National Assembly's speaker simply because she is a woman. A cleric feels insulted to vote for a woman. This trend would end slowly and gradually. TNS: What should be done to rectify the situation? SQ: Struggle, raise voice. This is what we can do and hopefully this trend will also end. TNS: What are your future plans? TNS: Being a peace activist, how do you look at the nuclear programme of Pakistan? SQ: I think that Pakistan should not have a nuclear bomb in the first place. We spend a lot of money on the security of our nuclear assets. If we had spent this money on people, their lot must have changed. The country's defence budget should be cut down and it should be debated in the National Assembly. The prevailing violence in the Federally-Administered Tribal Areas (Fata) and non-projection have been casting a shadow over the tourism sector, though all the seven tribal agencies offer scenic sites to tourists and holiday-seekers. The Khyber Steam Safari (KSS) is no exception and requires immediate attention to resume its glorious ride between Peshawar and the enchanting Landi Kotal. Dubbed as "a unique ride through the legendary Khyber Pass", the flag-bearer locomotive of the Pakistan Railways is dysfunctional for the last 10 months. It is likely that in the ensuing summer season, many foreign excursionists visiting Pakistan would miss one of the five celebrated trains of Asia. Among the good things that the British left in their most fabulous colony was the connectivity of the whole subcontinent through railways links. Being pioneers in the field, the British brought this technology to pre-partitioned India. Khyber Railway too is one such example of the achievement of those who conceived its idea (though with strategic conception against the Russian threat) and materialised it for the posterity. The 1920s model vintage oil-fired steam engines, which push and pull the carriages from the rear and front, were built by the Valcon Foundry Kingston and Company, the United Kingdom, and it started moving between Peshawar and Landi Kotal on November 4, 1925. Victor Bailey, the wife of the engineer who was assigned the construction of the track, ran the first train on the Khyber Pass Railway. The steam safari carriage climbs more than 1,200 metres through 34 tunnels and 92 bridges, and culverts to reach Landi Kotal. Khyber Railway has experienced ups-and-downs of the time: the train's operations were stopped in 1982, as it was not viable commercially. However, in the 1990s, the KSS was launched by a private enterprise in collaboration with the Pakistan Railways. The steam-operated carriage covers about 50 kilometres in almost five hours to reach Landi Kotal, located in the historical Khyber Agency, from Peshawar. The parlour of the train comprises 75 seats, including 28 widow seats, with onboard kitchenette, service counter and two toilet facilities. One of the unique features of this train journey is that its path passes through the Peshawar Airport runway -- making it the only airport in the world through which a railway line passes. The Pakistan Railways and the private travel enterprise operated the KSS successfully till May 14, 2007, when 15 ambassadors and high commissioners of European Union countries enjoyed its journey through Khyber Agency. Ever since the KSS has not been in operation, a powerful flood has washed away its track at several places, as well as damaged several bridges that it used to cross on its way. Pakistan Railways authorities, unfortunately, have so far not been able to restore the damaged track. The managing director of the Sehrai Travels, which jointly runs the KSS in collaboration with the Pakistan Railways, Zahoor Durrani, tells The News on Sunday: "The safari train needs special attention of the new government, as the previous regime had no interest in it -- no interest in something that attracts globe-trotters and can contribute immensely to the tourism industry of the country. A lot of travellers from other countries contact me to know about its resumption, but due to the damaged track I cannot oblige them." He says if the track and the bridges are repaired, the journey can resume within a few months, and can attract many foreign and local tourists. "The resumption of the train has an enormous potential to contribute to the prosperity of the people of Khyber Agency, who already lack employment opportunities, besides portraying a soft image of the tribal areas," Durrani believes. Answering a query about the security of the train, he says: "It could be a target for the anti-social elements in the tribal area." Durrani, however, expressed his confidence that the government would be able to resolve the strife in the troubled parts of Fata through non-violent means. "If we take the local tribal people into confidence, they would co-operate -- they also want to show their way of life to the rest of the world," he adds. But security of the train is a matter of genuine concern -- a couple of months ago, Pakistan's Ambassador to Afghanistan Tariq Azizuddin was abducted from Khyber Agency along with his driver, while on way to Kabul. So far, whereabouts of the two are shrouded in mystery. On the other hand, the firebrand Lashkar-e-Islam, a Bara-based militia, and Kokikhel tribesmen of the Jamrud tehsil are at loggerheads with each other. The growing tension between the two groups may create law and order problems in the area, and the journey of the train may not be very safe. Preserving the history and things of antiquity is an art in the modern world, and nations take pride in conserving the unusual things of the bygone ages. Perhaps India is more known for its Taj Mahal than anything else. Similarly, China has earned fame for its Great Wall and Egypt is more visited by travellers for its pyramids than for anything else. Pakistan, of course, has a number of excellent tourist destinations. However, due to poor performance of the concerned authorities, the country's tourism sector could not develop into a saleable commodity. The KSS poses a big question to the management of the Pakistan Railways, the tourism ministry and the rulers of the country. 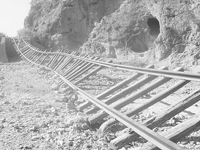 The British, during their stay in the undivided India, laid the track for Khyber Railways and regularly operated it in the face of fierce hostilities of the locals. But, after the passage of almost a century, the concerned authorities could not even repair its track and ensure the security of this antiquated steam engine connecting Peshawar to Landi Kotal. Pakistan does not have an enduring democratic tradition. Since the country's inception, it has experienced three extended periods of military rule, interspersed with short spells of democratic government. Though elections were held periodically, they usually reflected regional populist loyalties. 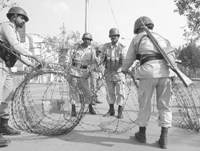 A dominant view is that frequent military interventions have stymied the democratic process in Pakistan -- by centralising power and authority, the military has completely destroyed the legislative, judicial and executive organs of the state. By the same token, the space available to the media and civil society has been constricted. Pakistan, as a result, has experienced constitutional, economic, security, ideological and sociological crises throughout its history. Economic policies have delivered growth without addressing the issue of poverty or income inequality. These policies have combined with under-spending on education and health, to create a palpable sense of injustice and deprivation among the masses. Inequities as a result of these policies are further compounded by the interweaving of religious and secular law (with, among other things, its inherent gender biases), the arbitrary enforcement of law and absence of judicial recourse, and the supremacy of federalism with its attendant appropriation of provincial resources. In turn, economic, social and judicial excesses have bred both secular and religious militancy. While the latter has both global (al-Qaeda) and local (the Taliban) origins, the alienation engendered by national policies also provides fertile grounds for the emergence of secular nationalist movements. Thus, a culture of crime, conflict and confrontation pervades the Pakistani society today. Pakistan has also enjoyed limited spells of democratic rule, but this has failed to establish a foundation for more enduring institutions. Transitions to democracy have also often been inconclusive, and the resulting 'semi-democracy' has been more conflict-prone than either genuine democracy or full-blown autocracy. Though even a 'semi-democracy' motivates political contest and the organisation of interests, it lacks the institutional mechanisms for 'interest mediation', much less the capacity to address the underlying grievances. in politically difficult environments like that of Pakistan -- where violent conflict is a recent memory or where social, political or ethnic tensions are running high ñ this can make for an explosive mixture. Pakistan's history of democratic rule suggests elected governments have fared no better than their military counterparts. These periods have been prone to economic mismanagement, policy reversals, inter-provincial discord and the miscarriage of justice. Further, civilian governments have aggressively instigated cross-border provocations with India, inviting damaging reprisals. In a comparative sense, inter- and intra-state violence has been an endemic feature across regimes. At first glance, one can attribute these outcomes to the transitional character of democracy -- while space has been created for political contest, elected governments have not been able to advance to the state of institutional maturation where 'interest mediation' becomes possible and national interests subsume parochial concerns. The explanation for the intermittent nature of democratic rule and the failure to institute pluralistic processes partly lies in the military-executive nexus. The army represents a unified chain of command, which has remained intact even during times of crises, such as the separation of Bangladesh in 1970 and the withdrawal from Kargil in 1999. It has maintained a stranglehold over the country's economic resources, establishing an economic base at par with a large global corporation. To a large extent, the army's economic and political clout derives from its strategic alliance with the United States and other Western powers -- initially in the fight against communism and more recently against the threat of terrorism. It also maintains a mutually reinforcing relationship with the executive branch, with a hierarchical mindset inherited from its colonial past. However, over time, tensions have started to emerge as the military has increasingly begun to take over and manage civilian affairs. The military's control over the legislative and judicial branches of the state has had the most emasculating effect on the growth of democratic pluralism in Pakistan. On the other hand, structural weaknesses within the political parties have left them vulnerable to military takeovers. Simply put, these parties are defined by their feudal constructions or by their ethnic, religious and sectarian divisions. A dynastic-feudal politics prevails where populism masks the surgical divide between the politicians and their constituents; and internal party decisions flow through hierarchical channels, rather than through consultative processes. The army has been quick to exploit political fissures. Opposition parties have helped military takeovers, often instigating the process through informal negotiations. On the face of it, the legislature has demonstrated a measure of independence; for instance, Nawaz Sharif (1997-1999) dismissed one chief of army staff and was on the verge of throwing out another when his government was dissolved. However, such displays of independence are driven mostly by power imperatives rather than by public demand. Thus, during the famous Sajjad Ali Shah case, in a blatant show of authority, Nawaz Sharif ordered his henchmen to storm the Supreme Court building. The late Benazir Bhutto and her spouse, Asif Ali Zardari, though relatively secular, were no less autocratic during their rule. Ultimately, they too fell from grace, charged with crimes ranging from corruption to the outright murder of family members in an internecine power struggle. The judiciary, for the most part, has remained subservient to both military and civilian governments, legitimising extra-constitutional acts through diverse constitutional amendments like the infamous and much invoked 'doctrine of necessity'. A corollary to the loss of judicial independence has been the traditionally low importance given to public litigation against economic, social and human rights excesses. Similarly, the media has been severely repressed and civil society groups have been denied access to the corridors of power, unlike their counterparts in other countries. Thus, the three entities with the strongest penchant for constitutionalism have traditionally been the most marginalised. Not surprisingly, growth-oriented economic policies, unconstrained by fiscal accountability, have widened income disparities. There is no evidence that suggests that elected governments have been more successful in eliminating poverty than their military counterparts. In fact, the country's economy has performed better during military governments, mainly due to easier imposition of taxes and adoption of harsh economic policies, though without the 'trickle-down' effect. Also, in comparison with military governments, civilian governments have paid only lip service to progressive social legislation and issues like women's empowerment. Political instability breeds conflict, both intra- and inter-state. The several manifestations of intra-state conflict are sectarian violence, crime, militancy (of al-Qaeda and the Taliban variety), dissident movements and civil unrest. An appropriate research question would be to examine the correlation between various types of conflict, political instability and regime change. A series of related and unrelated events in the recent past, highlighted by the dismissal of the superior judiciary, appear to have nudged Pakistan on a constitutional course. Do these changes offer any hope of a more tangible and long-lasting political change? First, multilateral donors have launched a series of initiatives, aimed at generating constitutional awareness and responsibility, governance improvements, judicial reform, departmental strengthening and political decentralisation. Concurrent economic initiatives include fiscal decentralisation and improvements in fiscal governance. The key donors are the World Bank, the Asian Development Bank, the United Nations Development Programme, the European Union and United States Agency for International Development. It is ironic that most of these initiatives, with a focus on institutional strengthening, took place under a military dispensation. It can be argued that regime change was never an intended outcome of these reforms; a key objective was to create a stable political and socio-economic climate in Pakistan, aimed at keeping the rising threat of religious fundamentalism and militancy at bay. Essentially, this has bred duality -- efforts to give democratic impulses a material shape co-exist with the acceptance of barely-concealed authoritarianism. Thus, foreign governments obsessed with the 'war on terror' have tended not to cavil too much about democratic transgressions that have taken the form of engineered elections, human rights violations, and suppression of the media and judiciary. Second, over the past three years or so, the media has been given unprecedented rein, allowing open debate and discussion on a wide range of subjects. However, the frequent disclosures of government misdemeanours forced a rethink and an attempt was made to circumscribe media freedoms. But having let the proverbial genie out of the bottle, the attempt has not entirely succeeded. Third, the Musharraf government adopted the mantra of 'enlightened moderation'. While the intent was to convince the West of its secular credentials, rising anti-West sentiment -- combined with the entrenched strength of militants ñ made such compromises necessary that diluted the progressive thrust of social legislation. The government did, however, increase women's representation in the legislature, armed forces and in public departments. Civil society groups have latched on to such opportunities, and have been relentless in pushing their social and political agenda. Unlike their Indian counterparts, they lack a direct access to decision-making circles. The situation, however, is gradually improving in their favour. While the future brings opportunities, it also poses many risks. The elected government's survival will depend on whether it can move beyond vendettas and factional politics into the realm of public policy-making. The challenges are enormous, ranging from the 'war on terror' to inflation, and the shortage of food, energy and water to rising crime. In the institutional development context, the government will need to respect judicial autonomy, make space for civil society, respect media freedoms, decentralise decision-making authority to the provinces and divide national resources more equitably. In current circumstances, these are the minimum prerequisites for political stability. The Federal Board of Revenue (FBR) evaluates its performance in terms of 12-14 per cent growth it has achieved in revenue collection in the last five years, which in real terms -- after taking into account the ever-soaring inflation rate -- is no more than five per cent. Even this growth has been achieved by shifting the burden of taxes to the poor through increased reliance on indirect taxes. The most disappointing aspect of FBR's reform efforts in the last five years has been its failure to improve the tax-to-gross domestic product (GDP) ratio, despite the imposition of all kinds of regressive taxes. In financial year 2006-07, the FBR surpassed even its revised target by more than 10 billion and collected Rs 843 billion. It could have easily collected Rs 1 trillion had unjustified exemption not been extended for another year to capital gain on sales of listed scrip. It is also a fact that the record revenue collection of Rs 843 billion was made possible largely due to the higher collection of import-based taxes and withholding of money at source from people who even did not have taxable income. The revenue target of Rs 1.025 trillion for the current financial year is under-fixed, as Pakistan's revenue potential is not less than Rs 2-2.5 trillion. This revenue potential can be tapped by broadening the tax base. There is a consensus among official and independent quarters that Pakistan needs to strive very hard to achieve the desirable tax-to-GDP ratio of more than 15 per cent (currently it stands dismally low at only 9.5 per cent). Radical changes -- like reduction in exorbitant sales tax rate, equitable tax base, and simpler and fairer tax procedures -- are needed to encourage investments and saving. The government needs to re-prioritise its tax goals while preparing budget for the next financial year (2008-09) if it wants to improve the tax-to-GDP ratio, coupled with rapid industrial and business growth. It is tragic that the previous regime showed least concern about the undocumented economy and benami transactions. The mighty sections of society are involved in such transactions and the FBR, being their handmaid, has neither will nor ability to tax them. Multinational companies -- through abusive transfer pricing -- evade taxes worth billions of rupees every year, while the FBR confers on them awards for 'excellent performance'. This also exposes the efficacy of the FBR as an institution entrusted with the responsibility to tap the real tax potential of the country. Anybody who pays sales tax should be entitled to claim refund of 20 per cent of the amount paid. The procedure for claiming refund should be simple -- the payee should send invoices to Central Tax and Refund Depository, which will authorise refund from the nearest branch of the National Bank of Pakistan, after verification of genuineness of the invoice (by checking sellers' registration number). In this way, the FBR can develop database of sales of all registered people and then cross-verify the same with the particulars declared by them in their sales / income tax returns; or, alternately, any person who pays sales tax may be allowed to claim credit of part of the amount paid, say 10 per cent against his income tax liability by producing all sales tax invoices obtained by him or her in the year. Detailed mechanism can be devised to cater to the situation where income tax liability is less than the amount of credit of sales tax. In this scheme, the people may choose not to claim full credit of sales tax paid by them, since they could not justify sources of their full expenses. To overcome this situation, the government can announce immunity for three years from scrutiny of their expenses declared through sales tax invoices. This scheme will encourage the people to obtain sales tax invoice for each transaction, which is currently not being done. The evasion of sales tax is mutually beneficial. If sales tax payers are given the above incentive, they will insist for invoice and the government -- without spending any extra money or making any extra effort -- will be able to expand the tax base. The recent scheme introduced by the Indian state of Kerala -- which has already been successfully implemented in Taiwan, Turkey and Venezuela -- can also be tried in Pakistan. The Government of Kerala has introduced five per cent sales tax on all retail sales, with incentive to both the shopkeepers and buyers. The shopkeeper gets 10-15 per cent refund of the tax collected and paid to the government and the buyer gets value-added tax (VAT) coupon of Rs 5 for every purchase of Rs 100. Every week a draw is held and coupons-holders get prizes. This scheme has boosted retail sales of shopkeepers who are willing to get registered with the government. It goes without saying that there has been a tremendous increase in government revenue since the introduction of this scheme. It seems that certain vested interests in the FBR want to keep the system complex, so that their corrupt practices keep on flourishing. The government must remember that if taxation is viewed as being unfair or favouring some chosen ones, it becomes counter-productive in the long run. Special efforts and rational policies are needed to restructure the tax system and restore public confidence in tax officials. Even a good tax system will not work if the prevalent negative mindset of tax officials does not change. There is an immediate need to improve both the system and the human fabric that controls it. The tax system must ensure rule of law and predictability of the authority that imposes taxes; principles of proportionality, efficiency, effectiveness, flexibility, continuity, reciprocity, fairness and equity; tax harmonisation; no double taxation or intentional non-taxation; non-discrimination; and strict anti-tax evasion rules. The FBR, instead of performing its prime duty of collecting revenues where due but avoided, is busy in constituting committees to ponder over many issues relating to tax policy and administrative reforms, which is in fact the job of the parliament. The FBR recently formed a task force to suggest measures for improvement in the taxation structure, by speeding up sales tax refund payment to the business community and analysing the scope of expansion in the general sales tax net to cover more services. The task force was given a mandate to analyse performance of the existing tax system with particular emphasis on expanding the tax base. In the past, the FBR has wasted a lot of time and money in the formation of such task forces, committees and what not, but the result has always been zero. The root cause of problem is the FBR's unwillingness to do what is its duty and indulgence in activities that fall outside its mandate or domain. The elected members of the parliament should take bureaucrats sitting in the FBR to task. It is purely the domain of the parliament to make tax policies and the FBR is only required to implement them. On the directions of foreign masters, who have given us a big loan of $ 100 million for tax reforms, the FBR has assumed the role of legislators and policy-makers. The FBR should be an autonomous body insulated from outside political, financial and administrative pressures; but in no way it should assume the role of policy-makers, which under the Constitution is sole prerogative of the people of Pakistan expressed through their democratically-elected representatives. The parliament should devise, following a democratic process, a rationale and acceptable tax policy after taking input from all stakeholders and experts in the field. This alone can help broaden the tax base and improve the tax-to-GDP ratio in the country. (The writers are tax consultants and also teach at Lahore University of Management Sciences. The image of madrassas has changed drastically over time. Once, they were considered as the ideological flag-bearers of the state. As a 'holy war' against the Soviet Union was to be fuelled by a zealot crop of recruits, all kind of state patronage was extended to madrassas. All that was associated with them was held in high esteem. Components of the establishment, predominantly the armed forces, carved a special niche for madrassas in their operation manuals. After the Soviet retreat in the late 1980s, however, the Western perception changed. Influenced by the West and irked by the misdeeds of the mercenaries disguised as clerics, the Pakistani establishment also took a U-turn in the late 1990s. As far as the syllabus is concerned, the centuries-old Dars-e-Nizamiya is still taught in most Pakistani madrassas. Demands of reforms, therefore, are being made by different quarters, mainly because this syllabus is outdated and not in line with the contemporary educational needs. The state has also started exerting pressure in a bid to diffuse the potential threat of militarism, thought to be evolving due to obscurantist policies and practices of the past. The clerics, on the other hand, refuse to acknowledge the need for reforms, at least those fostered by the state. The liberal elements are viewed as the arch-rivals of madrassas in Pakistan. In their pursuit to foster liberal thinking and attitude, they consider madrassas as the harbingers of retrogression and orthodoxy. Madrassas and clerics, in turn, denounce the liberals, terming them promoters of evil. Both the camps refuse to recognise the existence and subsequent validity of each other's school of thought, modus operandi of learning and the overall ideology of life. In comparison, academics and scholars have a mixed approach. Skeptical of the liberals, who demand dissent from the conventions, they mostly mend fences with the clerics and share some wavelength, at least on controversial issues, with them. The media, especially international outfits, paint a very negative picture of madrassas and their activities. More often than not, madrassas are shown as sites brewing anti-social activities. Brainwashing for suicide bombings, attacks on civilian targets hosting Western interests and other such happenings are all shown with madrassas in the background. The print media, especially the English press, is especially hostile to madrassas. Urdu newspapers, however, are not hostile to madrassas, and provide wide coverage to their activities and outlook. Similarly, feudals and landed aristocracy hold madrassas and clerics in high esteem, as they normally share the common perception of anti-progressivism. On the other hand, women's and human rights groups are suspicious of madrassas and clerics. One, the parents who cannot afford to raise their children -- let alone bear their educational expenses -- are left with no choice but to send them to madrassas. They, at least, have the consolation that madrassas shall house the child, and provide for his or her food, boarding and lodging. The parents also draw satisfaction from the assumption that because of their child acquiring religious education, the way to Heaven would be opened for them as well as the child. Two, destitute children and orphans who do not have any relative to look after them normally end up in a madrassa. The whole Taliban syndrome is an exemplification of how a sizable number of these orphans and destitute children joined madrassas as the only choice. According to famous journalist, Ahmed Rashid, the Taliban primarily evolved from the dozens of madrassas established in the refugee camps along the Pak-Afghan border territories. Besides teachings, these children received hands-on training on some of the most lethal weapons in the world. The Taliban, as a result, soon became an invincible force. Three, urban ultra-orthodox families send their children to madrassas to learn Nazra Quran or for Hifzul Quran. However, since most of these students do not have any other choice or outlet available to them, they become the captive clientelle of madrassas. Several issues are vital for consideration with respect to madrassas / traditional system of education. The pattern and system is in need of a dire change, at least in response to the sea changes that have occurred in the society in the past several decades. The doctrine that the religious corollaries and axioms are static, and thus do not need a change over, itself requires a review. By taking this stubborn stand, madrassas are likely to lose their very relevance to the society in which they operate. In this rapidly changing world, an impartial assessment of the situation seems to be a pre-requisite for a beginning towards change. Besides, madrassa administrations follow a very introvert pattern of operation. They are reluctant to engage into dialogue and discussion even with other components of the education sector. By taking this isolationist stand, madrassas seem to be losing the traditional sympathy that the masses in general and middle classes in particular used to have for them. Skill development with particular reference to the prevailing circumstances is non-existent. Former students of madrassas have almost no avenue for gainful employment. Either they opt for becoming prayer leaders (pesh imams) or prayer callers (moazzins); both jobs available in extremely limited numbers. Due to this supply side pressure, more and more mosques are being built -- some often at sites not legally allocated to them. Some of these students start offering tuitions to neighbourhood children of middle- and upper-income groups. But all these choices are temporary, and limited in scale and operation. There are many ways forward: the ulema / madrassa administrators need to analyse the prevailing circumstances in an impartial and honest manner. The harsh realities of both the local society and global environment must be understood to equate the potentials and threats. Unless this is done, very little improvement can be expected. The clerics need to open up to the outside world, so that people can freely access their viewpoints and vice-versa. They need to see the important realities of life as they stand today and put their acts together accordingly. The political corridors of Pakistan seem to be resonant with the voices of a fresh and enthusiastic start towards a vibrant political milieu. The parliament is expected to be a leading institutional arrangement to counter multi-faceted challenges to the country of more than 160 million people. Of these, whose power this parliament will use under the Constitution's provisions, a vast majority still lives in zones of silence carefully guarded by a feudal and elitist cultural ethos. How to genuinely empower the parliament itself and the people it represents is a question that needs enormous political acumen, foresight, and a sense of basic commitment to the democratic governance and dispensation. At the same time, the political economy corridor of the country also deserves a fresh and enthusiastic start. This corridor resonates with the protesting voices of regional and income inequality, both in terms of opportunities and access to productive resources. The voices in this corridor are not new. These are coming from the chambers of an ever-exploitative system of economic governance that systematically generates elitist capital accumulation, while excluding the not-so-rich and the poor alike. The system, by implication, ensures that the fruits of economic growth seldom 'trickle-down' to the people at the lowest level of economic hierarchy. As a result, the political economy of Pakistan, at this very moment, shows the signs of social polarisation leading to a stalemate -- failing to generate momentum for a long-term equitable economic development. This is a point where Pakistan, despite trying most of the policy instruments earlier employed by East Asian economies, fails to become a tiger economy, being perpetually trapped in a low equilibrium. In fact, East Asian economies could accumulate, use the accumulation for productive investments and execute structural transformation because of a couple of basic commitments. The commitments included that the state has to be responsible, effective, efficient and autonomous at the same time. Another basic commitment that newly industrialised countries of East Asia always kept was to acknowledge the ethnic diversity and inequality in society, and manage the 'trichotomy' of state-society-market relations in such a way that fruits of economic growth spread equitably. Their commitments delivered. 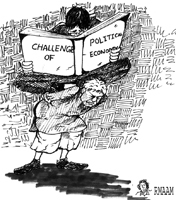 Look at the challenges of political economy for Pakistan! One can see that such challenges are no longer confined to managing the economic fundamentals and getting short-term results. Perhaps the post-9/11 situation -- which led to increase in inflow of remittances, and also brought some aid and debt-rescheduling, helping Pakistan's economy to re-emerge -- needs reassessment. This re-assessment needs to anatomise, besides using a monetary perspective, the structural causes of rising inflationary pressures, especially related to food items; worsening trade deficit; and the persistent unemployment. In fact, the real challenges of political economy are structural in composition, and go well beyond reliance on monetary and fiscal policy solutions. They enter the domains of economic governance, asking to review the role of the state in economic change. At the same time, these challenges are related with establishing autonomy of and accountability in the state institutions. Responses to these challenges entail bringing back the state into lived experience of the people -- the experience of welfare-oriented state that was promised by the founding fathers and later enshrined in the 1973 Constitution. So, the challenges of the political economy are to make the people believe, not by rhetoric but by action, that they can trust the capacity of the state institutions. The primary function of the state institutions is to prevent crisis, as well as protect the citizens in the case of financial and economic downturn, while facilitating people-friendly equitable economic growth and development. These challenges are not like the ones that can be met by bringing in bankers or military personnel on commanding heights of economic governance, or increasing or decreasing the money supply. These can also not be met with dolling out loans to the elites and writing them off later in the 'supreme national interest'. In fact, the enormity of challenges asks for developing a national development framework that is manifestly in sync with the spirit of the Constitution. At the same time, it is equally important that the state institutional arrangements show basic commitment to pursue the objectives of this framework. Perhaps the economic role of constitutional provisions needs to be brought to the fore while developing any public policy. In addition, the framework should not be about how to pursue more privatisation, liberalisation and deregulation. The sought-after should target the state institutions, making them fully functional, effective and competent to guide the markets. Pakistan needs a strong but democratic 'doctrine of state' embedded in institutional working that consistently builds social consensus for the kind of developmental policies needed to be pursued. Interestingly, many empirical studies show that not only the now-developed countries, but also newly-industrialised countries, have had both the state and corporate agencies for industrialisation and economic development. They did it while keeping bureaucracy aligned with basic commitment to equitable development, establishing a reasonable rule of law to prevent non-productive rent-seeking in its ranks. Such economies did not always believed in the so-called virtues of free-market-based resource allocations. They could guide such allocations to create and guide markets in preferred sectors and geographical regions. This type of policy and direct intervention by the state can create room for management of conflicts over economic resources. At the same time, the new government should realise that Pakistan does not sufficiently and equitably invest in human and infrastructure development -- required to generate and retain highly-skilled workforce to fuel the engines of long-term economic growth. Consistent investment in knowledge and technological capability, in a layperson's language, generates self-perpetuating momentum for a long-term growth. Similarly, increase in skill and knowledge level enables and empowers people to search new avenues to participate in economic development processes. Such investments, with socio-political equity in mind, can also mainstream the neglected regions and people in a society. To conclude, history shows that the true dynamism for economic growth does not come from prescriptions of economists or international development establishment; the real dynamism comes from leaders. If leadership is able to define the challenges correctly, coordinate the vision and processes for development, and make the state simultaneously autonomous and accountable, then the people of Pakistan can stretch all the production possibility frontiers. The political economy challenge to the new government is enormous, but this is also the right time to respond by mobilising all intellectual and political resources. The important issue is that which forces are instigating political violence and what long-term affects this trend is likely to have? What appears from the political history of Pakistan is that specific sections within almost all political and non-political communities have resorted to violent means in persuasion of their goals, and these violent acts have not only damaged that community's public image but also clouded its real objectives. For instance, the recent use of force by some lawyers against a former federal minister affected public impression of that community, as well as exposed differences within it. Going in the recent past, when Lal Masjid and Jamia Hafza students turned violent, it not only brought loss of innocent lives but also brought a bad name to the religious community as a whole. The same can be said about the May 12 incidents in Karachi, where certain elements of a political party were involved in violence leading to massive killings. This brought a bad name to the party, whose leadership may not be supportive of all these actions. There is a pressing need for minimising violent conflict between different communities, because politics of violence has resulted only in economic problems, political instability and strengthening of undemocratic forces. Motives for committing political violence can range from economic -- like poverty and inequality -- to political -- like lack of democracy, lack of openness, hate-vote syndrome and failure of the government to deliver. It is true that some political groups have exploited the multi-ethnic and multi-lingual aspect of the Pakistani society, and got popular through hate-vote syndrome. This syndrome has bred intolerant political behaviour, which, in turn, has resulted in politics of revenge and weakening of democratic institutions. The cost of politics of violence is very high. Besides the human loss, the country also suffers, in particular in terms of economy. This, in turn, inflicts further human misery in the form of joblessness or underemployment and flight of capital due to security concerns. There is no blinking the fact that Pakistan's business hub -- Karachi -- has suffered a lot because of the politics of violence. In 2006, the Karachi Chamber of Commerce and Industries (KCCI) estimated that a one day strike deprives the city and the country of more than one billion rupees in revenues and exports. However, the current KCCI president projected the losses at Rs 14 billion (this amount includes taxes and duties, production and exports, as well as losses incurred in commercial markets. According to the KCCI's calculations, Karachi suffered corporate losses of Rs 80 billion in just five days during the mayhem that followed Benazir Bhutto's assassination. According to a research study, political violence has significant short- as well as long-term effects on the society, in terms of physical and psychological trauma, financial losses, poor schooling and health, biased pattern of child development, migration of families, and further division of society into identifiable communities that may prolong the conflict. Revenge seeking and score-settling behaviour also results in political instability in the country. In this way, non political forces exploit this situation and democratic forces suffer losses in the form of discontinuation of elected democratic process. There is also a view that the recent wave of violence is an attempt to change the public opinion that democracy does not suit us, and the politicians are not only incompetent but also responsible for the miseries of the masses. Pakistan is passing through a difficult juncture in its history, and it is high time that political leaderships realise this reality; and forget the differences and work collectively for the betterment of the country. Instead of paying lip-service to the virtues of non- violence and tolerance, we all have to work together to address the root causes of political violence. Pakistan needs ethnic, as well as political harmony, for the smooth functioning of democratic institutions. Besides this, when one political group tries to achieve its objectives through violent means, in the absence of justice, the other group retaliates. Consequently, violence breeds violence, and the country faces political and economic instability in the form of loss of lives and property. We have witnessed that foreign investors are leaving the country because of heated up political violence since the last year. As a result, Pakistan's economy is suffering a lot due. This now is the responsibility of the democratic forces to collectively strive to build a law-abiding democratic society. Leaderships of political parties need to show exemplary maturity in their conduct. Instead of adopting the path of politics of violence and revenge, they need to sit together and work for the supremacy of rule of law, as well as to provide relief to the masses and mitigate their sufferings. They need to practice the politics of tolerance and adopt the path of constant engagement, rather than confrontation. Doors for reconciliation and cooperation should not be closed in the larger interest of democracy. All the stakeholders should play their due role in strengthening democratic institutions in the country. Political leaderships have to prefer politics of reconciliation over that of revenge and confrontation, and spirit of mutual tolerance would have to be reflected in their actions. It is expected that good democratic ideals and traditions would be followed, and all energies would be devoted for mitigating the sufferings and problems of the masses. In transition to democracy, it is essential to achieve national reconciliation and consensus, as this could prove to be a major stabilising factor. Instead of indulging in the politics of hate and revenge, all efforts should now be directed towards meeting the challenges facing the country.